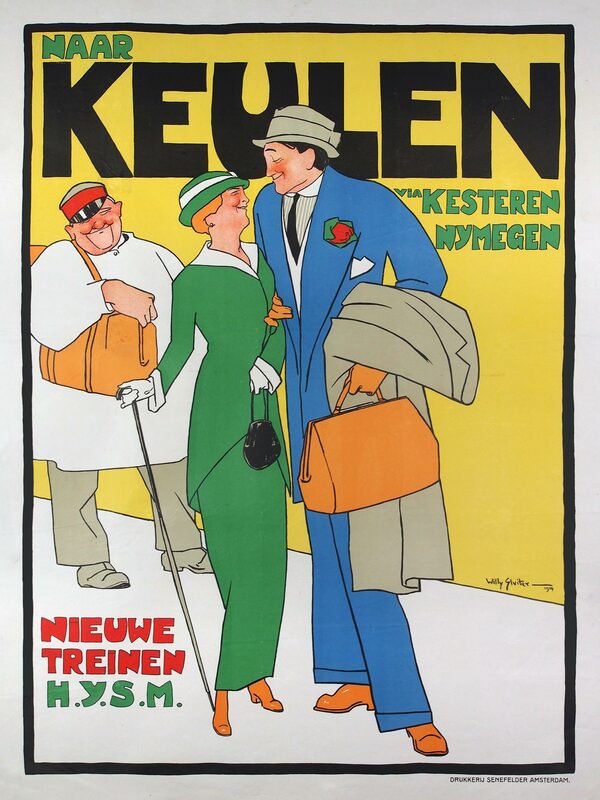 Early Dutch railway posters mostly featured detailed timetables in small print, sometimes supplemented with cliche images of trains. The versatile artist Willy Sluiter changed all of this in 1913 and 1914 with his posters for train travel to the Riviera, Cologne and the Dutch seaside. Sluiter did not depict trains or landscapes, but people: passengers, railway staff and locals. He did this in a distinctive cartoonesque way, using humor and flair. The relatively short texts were integrated in the image. More than a century later, Sluiter's bright colors still look strikingly fresh. Willy Sluiter (1873-1949) was known as a 'gentleman artist'. He created portraits, beach scenes, political cartoons, book covers and posters. Raised in the village of Zwijndrecht and trained at the art academies of Rotterdam and The Hague, he lived in fishermen's villages and artists' colonies such as Scheveningen, Katwijk, Volendam and Laren. His subjects ranged from the simple life of fishermen to fashionable city life. In higher circles he was a popular portrait painter. 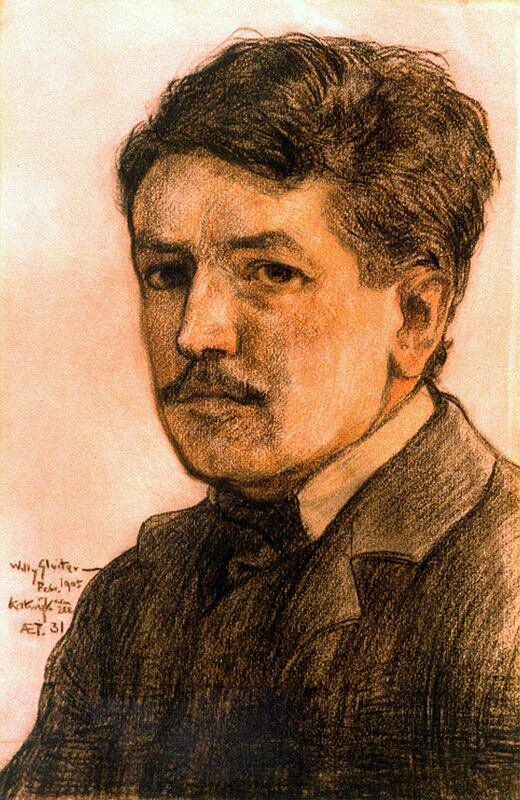 Sluiter was inspired by the French post-impressionists and the posters of Henri de Toulouse-Lautrec. 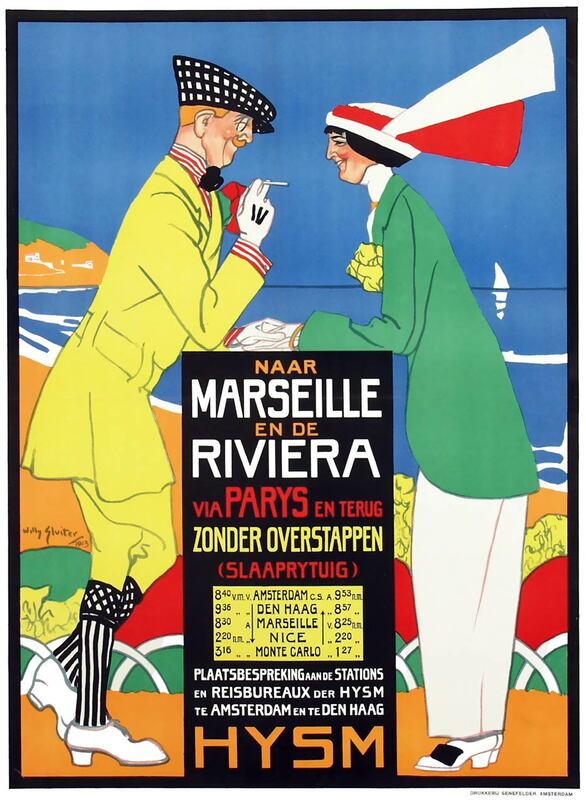 Sluiter's first railway poster dates from the autumn of 1913: To Marseille and the Riviera via Paris and back without transfer. 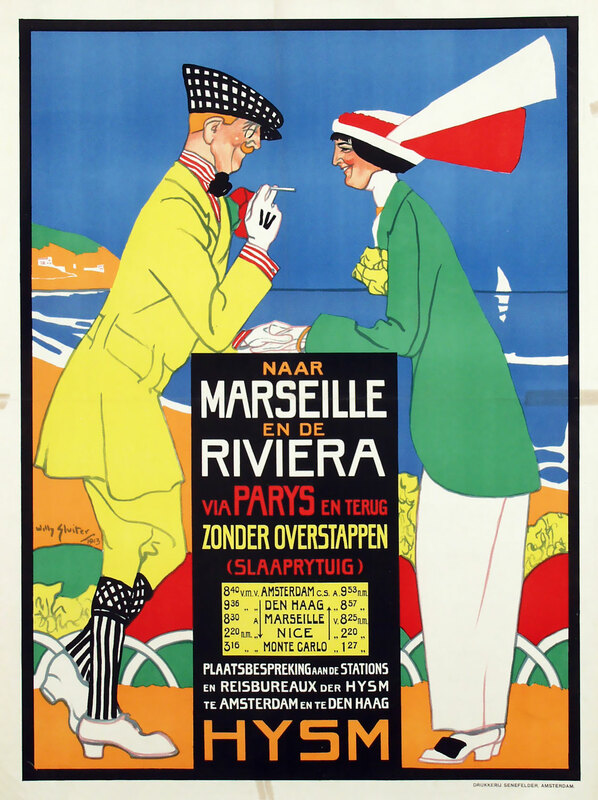 HYSM started a direct sleeping car service from Amsterdam and The Hague to Marseille and the French Côte d’Azur — a popular place for the upper class to spend their winters, while Marseille was the starting point for steamers to the Dutch East Indies. At Paris the carriages were linked to the Méditerrannée Express of PLM and Wagons-Lits. The total journey took less than 24 hours. The HYSM service was an alternative to the Riviera Express, ran by its competitor Staatsspoorwegen (State Railways) and Wagons-Lits. Because of the First World War the train service had to be discontinued after only one winter season. On the elegant poster a couple is enjoying their holiday on the Mediterranean, relaxedly leaning on the announcement text pane. The man is wearing a stylish English sports suit and holds the gloved hand of his equally sporty female companion. Sluiter only needed a few simple lines, combined with some bright colors, which makes this poster ahead of its time. The design must have stood out among the other posters at the stations, full of 'stiff uppercase letters that seem to have been taken directly from the official timetables' (Feith). The self-drawn letters on Sluiter's poster had a matching style and color. Sluiter's original gouache has been preserved in the Dutch Railway Museum. On this design the HYSM train service was still denoted as Riviera and Lloyd Express (in a playful alternation of upper and lowercase letters). This reference to the service of the same name by Staatsspoorwegen and Wagons-Lits was probably waived to prevent conflicts. The Riviera Express ran via Germany, combined with the LLoyd Express to Genoa. Since the opening of the Suez Canal, ships from the Norddeutscher Lloyd departed from Genoa, while Marseille was the port of departure for the Rotterdam Lloyd. 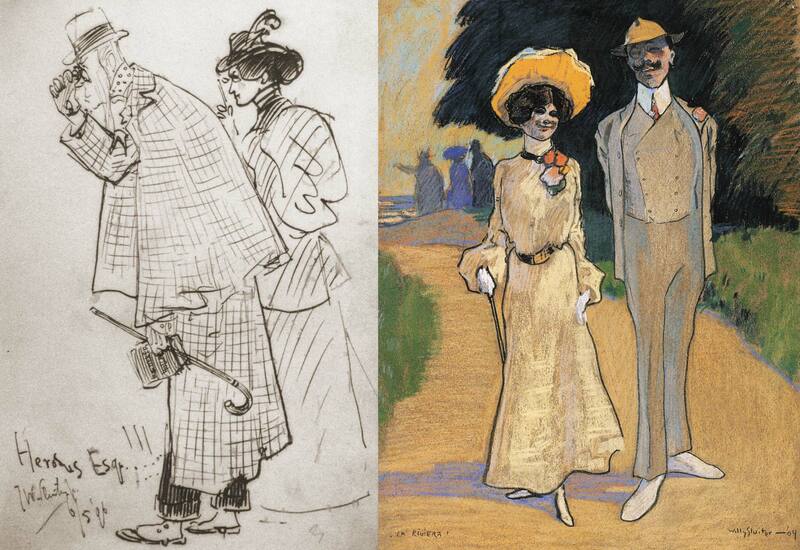 Sluiter liked to portray fashionable couples. In 1896 for example, during a long trip abroad, he drew a tourist couple with a Beadeker guide. In 1904 he captured a couple on a pastel titled La Rivièra. 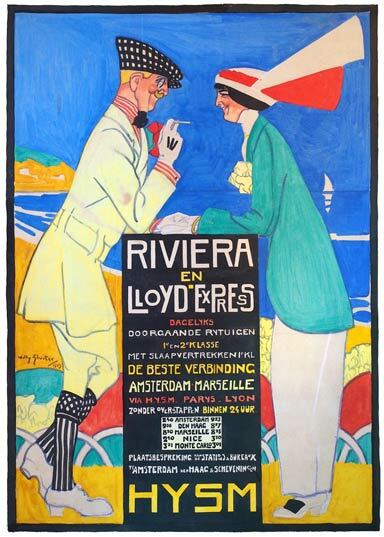 Perhaps they partly inspired Sluiter for his poster of 1913, because as far as we know he did not visit the Riviera again since. 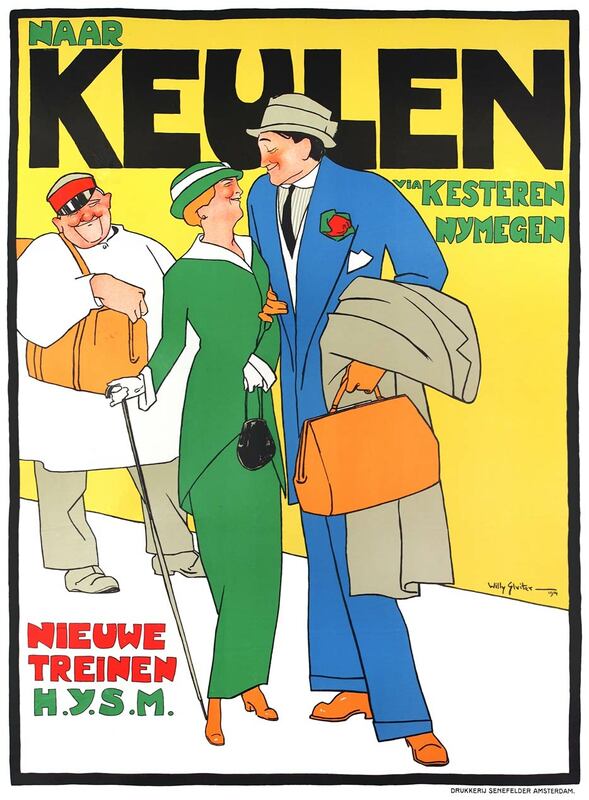 He also preferred couples on his commercial posters, for example for De Hollandsche Revue magazine of 1913. 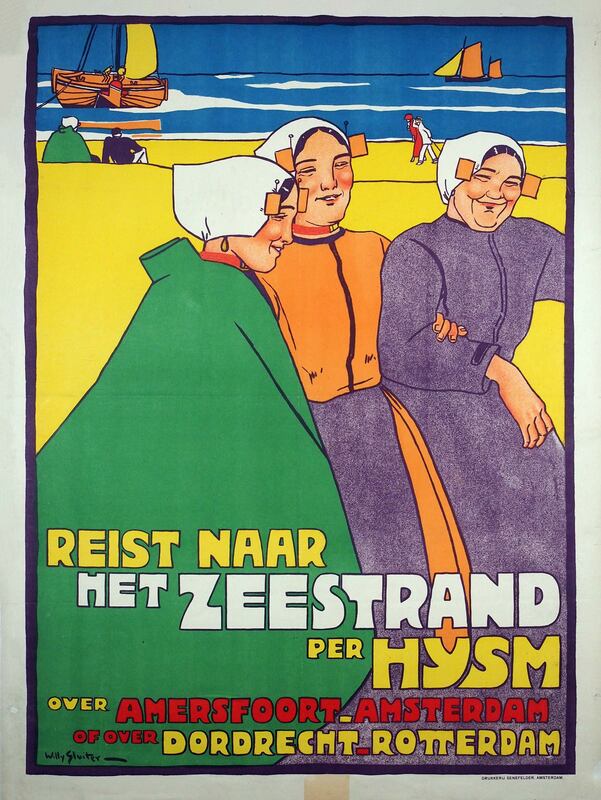 In 1914 the poster Travel to the sea beach by HYSM via Amersfoort-Amsterdam or Dordrecht-Rotterdam appeared. Even more than on the Rivièra poster, the hand-drawn letters are an integral part of the design. The colors are bright and cheerful. Three young fisherwomen on the beach are dressed in traditional local costume, while small boats are sailing the surf in the background. 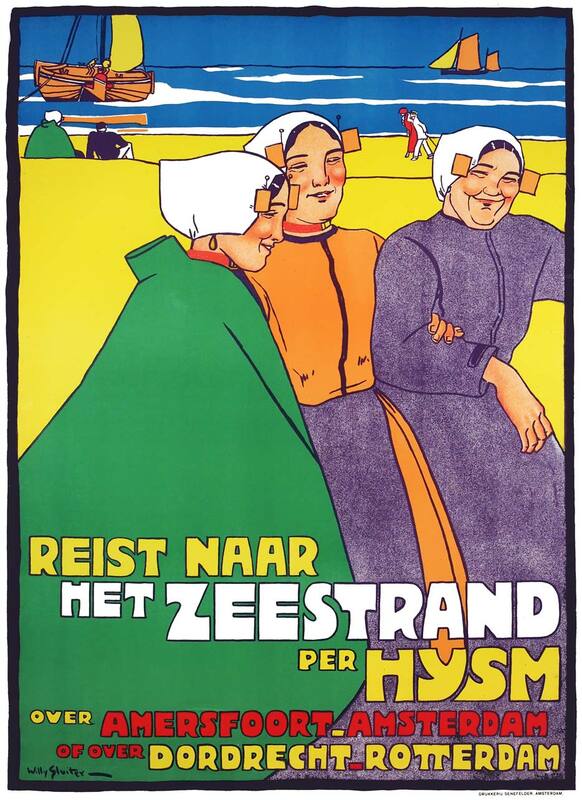 A magazine described them as 'Zandvoort girls', but the seaside resort of Scheveningen was also accessible by HYSM and its subsidiary ZHESM. Sluiter knew both resorts very well; beach life and fishermen were common motifs in his art. Advertising trade journal De Bedrijfsreklame appreciated the poster: 'Good drawing, vivacious coloring, maintaining simplicity in flat colors; a striking, pleasant-looking poster has emerged here, which undoubtedly serves its purpose.' 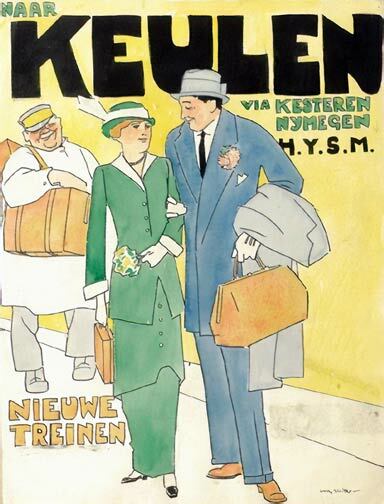 The artistic value of Sluiter's posters was already obvious, as evident from the fact that HYSM sent them to the Rijksmuseum (National Museum) upon publication, which directly included them in its collection. 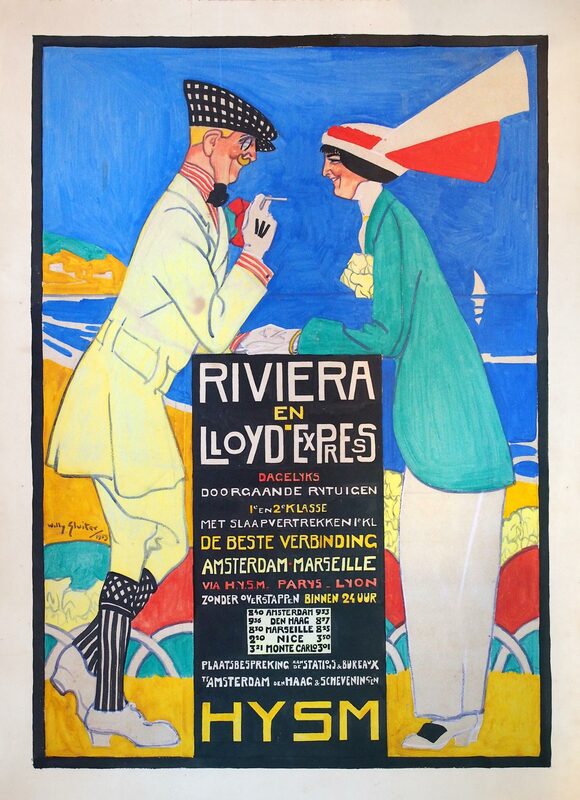 And because of his HYSM posters, the German magazine Das Plakat called Sluiter 'one of the very first artists in Holland to design artistic posters'. 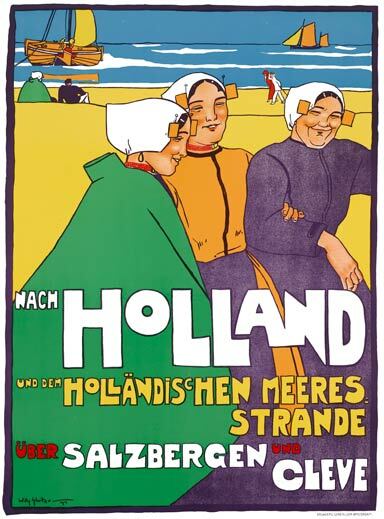 Although the poster also appeared in Dutch, German tourists were an equally important target audience for the Dutch seaside resorts. 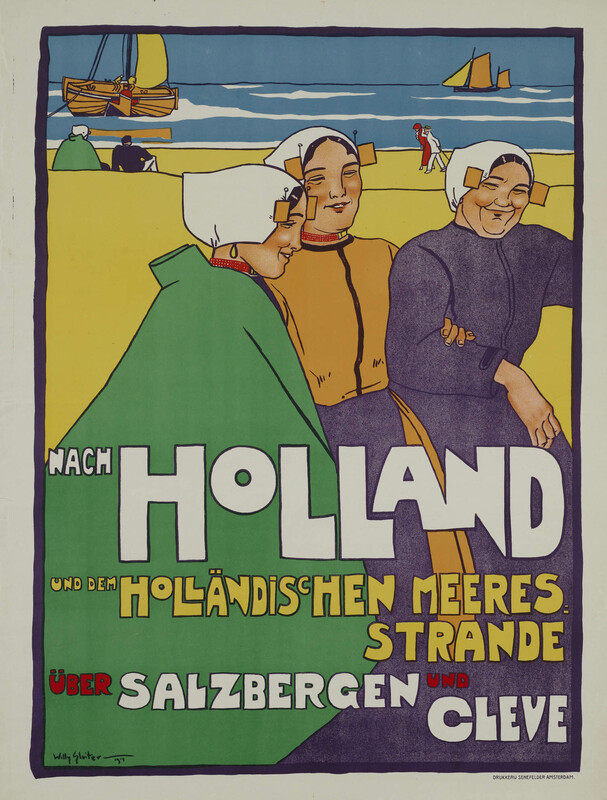 The German-language version of the poster was given a different text: To Holland and the Dutch sea beaches via Salzbergen and Kleve. While Dutch train travelers were offered the option of traveling via Rotterdam or Amsterdam, the Germans were presented the more practically relevant border stations of Salzbergen (near Oldenzaal) and Kleve (near Nijmegen). Sluiter's third railway poster, announcing new express trains to the German city of Cologne, was focused on travelers, not the destination. A couple in love is waiting on the platform while a luggage porter is watching them tenderly from the background. Jan Feith wrote it was remarkable that Sluiter did not depict a typical Cologne motif, such as the famous Cathedral, but three cheerful people. Two weeks later his readers were able to judge for themselves, as the poster was folded into the newspaper as an advertisement, that is to say 'in the copies in the cities and those delivered by agents'. In 1913 HYSM had introduced a 'fast connection' to Cologne. The next year, with the delivery of new locomotives, the journey time could be shortened to 4 hours from Amsterdam. Previously, Cologne had only been accessible by D-trains with a surcharge, or through-carriages in international night trains. The new, affordable express train with 1st, 2nd and 3rd class seats departed from Scheveningen and Rotterdam as well as Zandvoort and Amsterdam. The two trains were combined at Kesteren in the Betuwe region, to continue together via Nijmegen and Kleve. On the first design for the poster in watercolor, the man and woman look a lot less lovingly at each other than in the final result. The women also carries a flower bouquet and a different handbag. The porter was eventually given a red cap instead of the yellow one. Furthermore, the position of the text was changed, but all in all there are not many substantive differences. Although only three genuine railway posters are known to be made by Willy Sluiter, he also created a poster design for the ferry service between Hook of Holland and Harwich. This important link between England and the continent was owned and operated by a railway company: the British Great Eastern Railway (GER). HYSM had a railway station at Hook of Holland, and worked closely with GER, for example in operating a joint London-Berlin train service. This makes it is likely that HYSM also commissioned Sluiter to create this poster design. 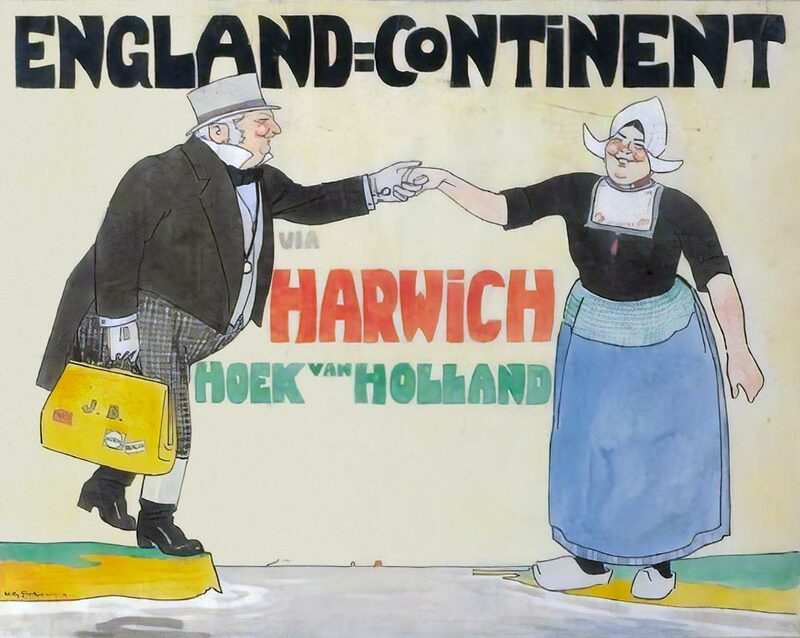 The image, in this case horizontal, shows an English gentleman and a Dutch woman in traditional costume reaching out to each other across the sea. As far as is known the poster was never executed in print, perhaps because of the outbreak of World War I. In his further artistic career Sluiter produced no more railway advertisements, with one exception. 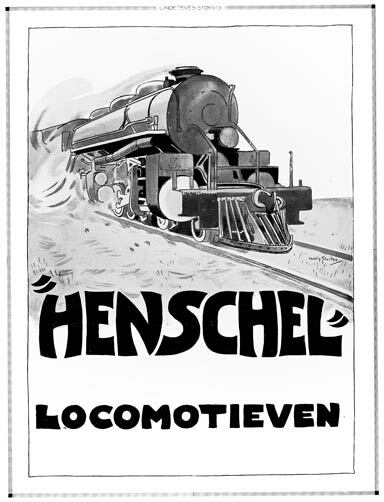 In 1921 he designed a black and white magazine ad for Henschel locomotives. The assignment came from Lindeteves-Stokvis, a trading house that represented the German Henschel in the Dutch East Indies. 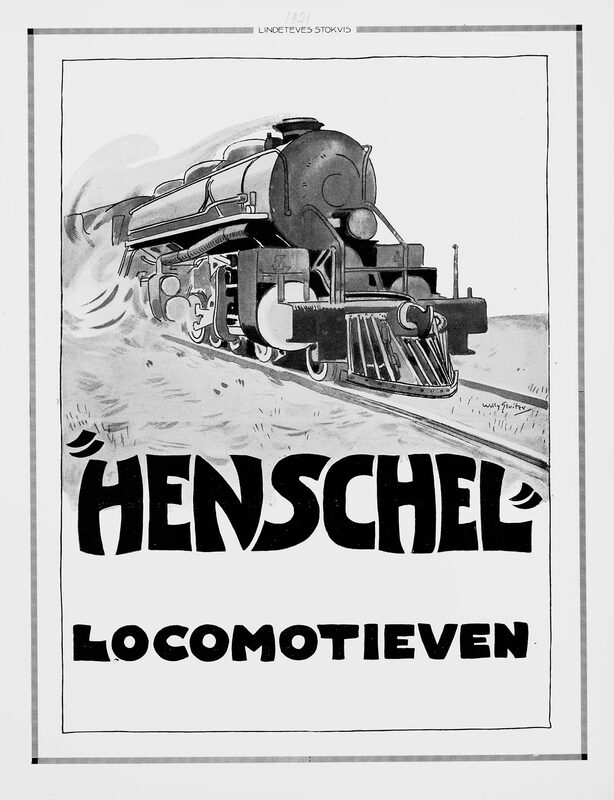 In addition to heavy engines for railway companies, Henschel also offered smaller locomotives for industrial use.